I found these photos during my search for inspiration and love something different about every one of them! Are you entertaining this holiday season? If so, what's your plan of action for the decor and color scheme? Love the candy cane stripes. And the green/brown. Great ideas! 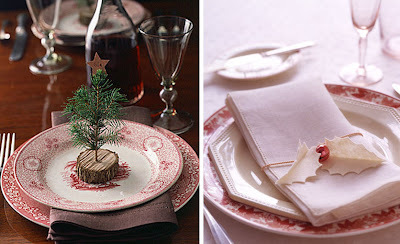 Great ideas - I LOVE the little tree! I was loving all the red and white place settings but when i got to the last one...the green and brown THAT is my favorite! It's gorgeous! 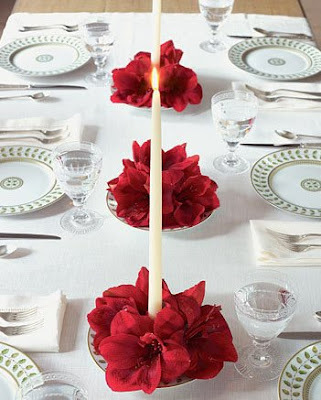 I love the red plates with the BRIGHT green flowers - gorgeous intensity of color! The little tree is pretty adorable, too. I wish I were, but our house is still under construction. 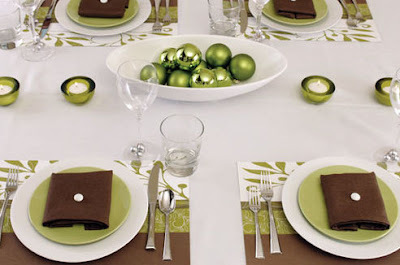 Love the green and brown, the little tree on the plate, the berries napkin ring, the white on white...all of it! I was just starting to freak out about hosting a big holiday dinner with my extended family...trying to figure out how to decorate the table in a unique way...and then you solved all of my worries with this post. THANK YOU!!! i'm so happy you found inspiration :) good luck with your holiday dinner! wow! you're a brave soul! 18 people! i love those little cardinal name tags in the second to the last picture! 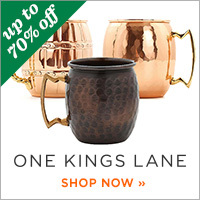 we have been thinking of having a sixties-themed party for New Years. not really a dinner party, so i'm not sure that any of these ideas would work. but, i like the green ornaments in the white vintage-looking oval bowl. i think something like that that would work well for the sixties theme. i hope your party is fun! if you entertain anything like your blog, then i'm sure it will be fantastic! 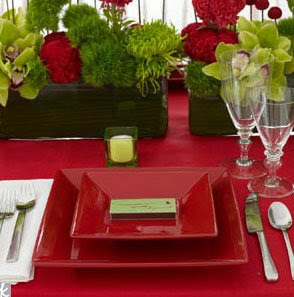 loving the red with the chartreuse green mums and orchids. They are all wonderful ideas that could be applied to different celebrations. 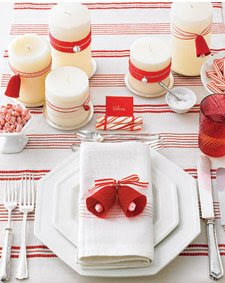 Will you post some pictures of your table setting when it is complete? Hope so! My fave is the red and white striped setting in the third image. It's festive but still graphic and clean. I am hosting my 5th Annaul Girls Christmas Party this weekend and I am excited. I have a guest list of 25 girls. 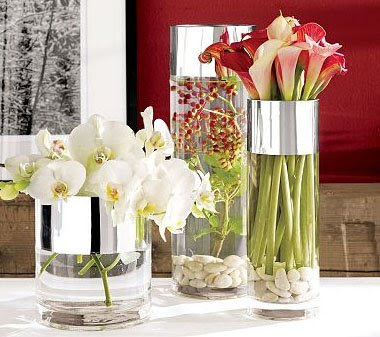 I love the use of cranberries,so this year I plan to have a couple of vases with cranberries and candles. I will also be using large white snowflakes for ceiling decor. 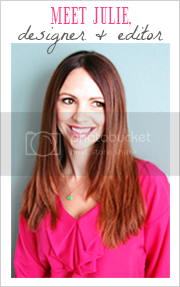 I am sticking with silvers & reds as my main colors..
Have fun with your party and be sure to share pics. HAPPY PLANNING!!! I am loving that red square plate one! 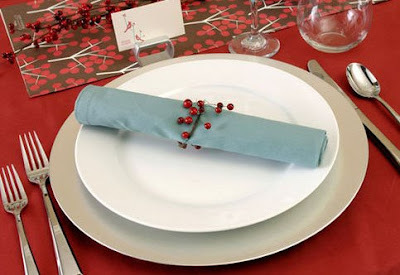 If you find out where the cranberry napkin rings can be purchased, please let us know!!! 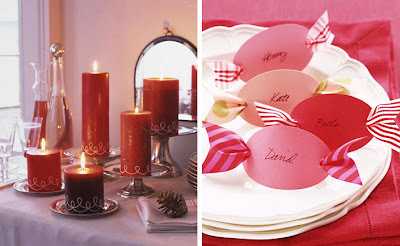 I love the cranberry napkin rings and love the place cards that look like candy! !